On February 1, 1898, Cecilio F. Lopez, first Filipino scientific linguist and academician, was born in Marikina (now) City. He is known in Philippine history as the "Father of Philippine Linguistic." 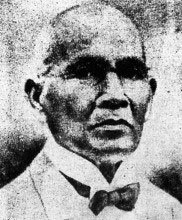 Lopez, the first Filipino to obtain a doctoral degree in linguistic at the University of Hamburg in 1928, pioneered his work in the growth of a Filipino custom using a scientific study of Philippine Language. On February 1, 1904, Luke E. Wright was inaugurated as Civil Governor of the Philippines following Howard Taft's departure. In his inaugural address Mr. Wright dwelt upon the need of industrial development and of transportation, especially railroads, and urged that encouragement and friendliness be shown to all who desired to enter the islands for their legitimate development. The policy, he said, should be one of "equal opportunities to all". On February 2, 1899, the National Citizen's Army, forerunner of the Armed Forces of the Philippines (AFP), was founded under the Malolos Republic. Its origins could be traced to the Tejeros Convention in 1897, where the revolutionary government of General Emilio Aguinaldo created the Philippine Army under Captain General Artemio Ricarte. On February 3, 1945, the American forces liberated nearly 4,000 prisoners of war in the University of Santo Tomas (UST) internment camp in Manila, which signaled the full American control and victory over the Japanese invaders in the Philippines. On February 4, 1899 at about eight o'clock in the evening, Private William Walter Grayson, together with two other members of his patrol, entered Barrio Santol in Sampaloc, Manila to find out whether there were Filipino soldiers in the vicinity. On February 5, 1842 the Wilkes treaty was signed at Soung, Island of Sulu. This treaty is the first written understanding between the government of the United States of America and the Philippines through the Sultanate of Sulu. On February 6, 1848, Marcelo Adonay, composer of religious music, was born in Pakil, Laguna to Mariano Adonay and Prudencia Quiteria, a peasant couple. Poverty left Adonay's parents no choice but to entrust him to the care of the priests at San Agustin Church in Manila. These are the priests who discovered his innate talent in music. Although he lacked a formal education in music, Adonay mostly self-taught mastered the organ, the violin, the contrabass, and the trumpet. His fellow composers considered him as genius. On February 6, 1964, General Emilio Aguinaldo, first President of the Philippine Republic, died at 3:05 in the morning at the Veterans Memorial Hospital where he had been confined for over a year, at the age of 95. On February 7, 1986, the Commission on Elections (Comelec) conducted the presidential and vice-presidential "snap" elections with incumbent President Ferdinand E. Marcos and former Senate President and Foreign Minister Arturo M. Tolentino running against the tandem of Mrs. Corazon C. Aquino and former Senator Salvador H. Laurel. On February 8, 1890, Claro M. Recto, a noted lawyer, Congressman, Senator, nationalist statesman and regarded as the Father of the 1935 Constitution, was born in Tiaong, Tayabas (now Quezon province) to Don Claro Recto, Sr. of Rosario Batangas and Doña Micaela Mayo of Lipa. On February 8, 1935, the delegates to the 1935 constitutional convention agreed on the final draft of the constitution after having deliberated for several months. It was signed by the 202 members on February 19. The convention which opened on July 30, 1934, was under the Presidency of Senator Claro M. Recto. On February 9, 1837 Father Jose Apolonio Burgos, one of the three Filipino Martyr Priests collectively called GOMBURZA, was born in the town of Vigan, Ilocos Sur. His father was Jose Burgos, a Spanish lieutenant in the Spanish militia of the Ilocos, and his mother was Florencia Garcia, a native of Vigan. He was baptized on the 12th of the same month. He received his first education from his mother, herself a woman of education and fine qualities. On February 10, 2003, Dr. Josette Biyo, a teacher at the Philippine Science High School-Western Visayas Campus, was honored by the Massachusetts Institute of Technology's Lincoln Laboratory in Lexiton, Massachusetts by naming a minor planet or planetoid (13241) after her. Planet Biyo is nine kilometers in diameter and is located at the belt between Mars and Jupiter. Dr. Biyo won in 2002 the grand prize in the Intel International and Engineering Fair in Louiseville, Kentucky. On February 10, 1899, the poem "The White Man's Burden: The United States and the Philippine Islands" by Rudyard Kipling, was first published in the New York Sun, a McLure's Magazine. It was originally written for the Diamond Jubilee celebration of Britains' Queen Victoria's reign, but was exchanged for the poem "Recessional", also by Kipling. Later, Kipling rewrote the text of "The White Man's Burden" to address the American colonization of the Philippine Islands.